Jennifer Aniston recently revealed she has a new love in her life: Boxing. Jennifer Aniston attends the Chanel dinner celebrating "Our Majestic Oceans, A Benefit" for NRDC, June 2, 2018, in Malibu, Calif.
Aniston's boxing trainer is Leyon Azubuike, the founder of a Santa Monica boxing gym and a former college football player, U.S. Nationals heavyweight competitor and chief sparring partner of a heavyweight champion. 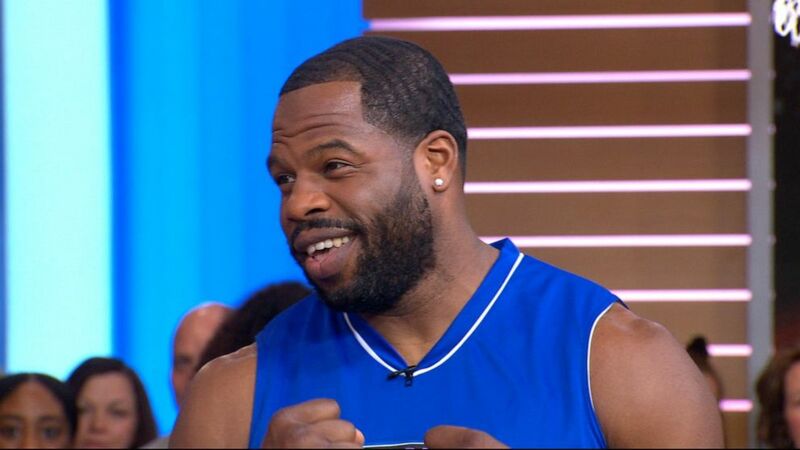 "Good Morning America" met up with Azubuike to learn more about the workout that Aniston, 49, described as a "great way to get aggression out." "The relationship has been built through a mutual respect for each other," he said of Aniston. "There's never been a time where I've said, 'Hey, do this exercise,' and she gives me resistance on it." Aniston's workout is focused on toning and fine-tuning her body, according to Azubuike, whose training sessions with the star run from one to over two hours. Azubuike shared 10 signature moves to do to work out like Aniston. Azubike recommends fueling 90 minutes before working out and refueling 45 minutes afterward, with an overall focus on healthy carbohydrates and lean protein. Jennifer Aniston attends the 46th AFI Lifetime Achievement award gala tribute, June 7, 2018, in Hollywood, Calif.
1. Jump rope: Focus on getting your ground contact time (the amount of time your feet are touching the ground each jump) to be as short as possible with each revolution of the rope. To keep your core tight, brace your abs like you are about to get punched and breathe in through your nose and out through your mouth while jumping. Pro tip: Focus on getting savagely good at basic, single jumps. This forms the foundation for all jump rope progressions and you won’t be able to move like a boxer until you can stand still and perform single jumps for at least one minute. 2. Lat pulldown: Begin in a seated position with your arms extended holding the band. Lean back about 45 degrees, brace your core, then pull the band down and touch the top of your chest. You should pretend that you are squeezing a pencil between your shoulder blades throughout the whole movement. Return the band to the top position under control. Perform this exercise for 10 repetitions each set. Pro tip: Punching isn’t always about pushing strength. By increasing the strength of the muscles in the back, punching power will increase significantly more than by just focusing on exercises that emphasize arm extension (i.e. bench press, incline press, push-ups etc). 3. Squat to row: With your arms extended and tension in the bands, get into a squat position and hold it at the bottom. Focus on tearing the floor apart with your feet to keep your core and glutes engaged. While squatting, pull the band to your chest, keeping your shoulders back and pretend you are squeezing a pencil between your shoulder blades throughout the whole movement. Pro tip: You want to keep your traps “turned off” during this movement to focus the pull on the muscles in your back. Pretend you have a cup of water on each shoulder and if you shrug them up, you will spill the water. 4. Military press: Stand in a back squat starting position with the band resting on your traps and your feet shoulder-width apart. Brace your core and push the band straight up over your head keeping your arms in line with your ears. Breathe out as you press the band over your head. Lower the band under control back to your traps. 5. Seated Row: With your arms extended and tension in the bands, keep your core braced while seated and your traps “turned off." Pull the band to your chest, keeping your shoulders back and pretend you are squeezing a pencil between your shoulder blades throughout the whole movement. 6. Spartan strike and stab: This is the movement of a warrior! Begin this movement in a half-kneeling position parallel to the cable machine. The rear foot should be closest to the cable machine. Use a pad to provide cushion for your knee. Reach across your body and grasp the cable at ear level with both hands. Pull the cable diagonally to your heart then finish the movement by stabbing downwards across the body. Keep the chest up and breathe out during each part of the movement. Perform this exercise for five repetitions each side, each set. Pro tip: To progress this exercise, you can a) use a split squat position removing pressure from the pad or b) bring your front and rear foot inline to create more instability and challenge your balance. 7. Wood chops: Stand facing the cable machine with your feet just wider than shoulder width. Sit back, hinging slightly at the hips and grasp the cable with both hands which will be slightly above your head. Keeping your arms straight, pull the cable down to one side of your body rotating through your thoracic spine (upper back). Stop the rotation when your hands reach hip level. Return the cable under control to the starting position and repeat the motion to the other side. 8. Kettlebell squat to press: Power comes from the ground, which means that legs are an important part of the body to develop. Start with your feet just wider than shoulder width apart and holding a kettlebell in a goblet position (like you would hold a bowl of cereal to finish the last bit of milk). Drop into a full squat, sitting back like you would into a chair and pause at the bottom making sure your body is upright. Stand back up using the momentum of the squat to finish the movement by pressing the kettlebell above your head. Lower the kettlebell back to your chest before performing the next rep. Pro tip: This exercise should be performed as one movement with a smooth transition from the squat to the press. If needed, regress the movement by using a lighter weight to help get your body used to the movement. 9. Seated lateral raise: Begin in a seated position with your arms extended to your sides. Keep your core braced while seated and your traps “turned off." Pull the band laterally, keeping your arms straight up to shoulder level. At the top of the movement, your thumbs should be pointing down to get additional activation in your deltoids. Pro tip: Focus on slow and controlled movement. 10. Front raise: Begin in a seated position with your arms extended in and palms facing down. Keep your core braced while seated and your traps “turned off." Keeping your arms straight, lift your arms up in front of you to shoulder level. Lower your arms back down under control. Editor's note: This story was originally published on August 10, 2018.